I'm so excited to be hosting Food 'n Flix right here at girlichef.com this month with my chosen flick: Monsoon Wedding! Now, I should be a good hostess and tell you what this film is about (in case you haven't seen it before). However, I myself have not watched it in YEARS. Even though I actually own it. Oi. It's tucked safely away in a drawer with a bunch of other movies that I adore, but haven't had the time to revisit as of late. So, I don't really remember much beyond I liked it enough to buy myself a copy. In its most basic form, it is a story of family, love, arranged marriages, forbidden love, India, Punjabis in Texas...chock-full of rich, glorious colors and dancing and I swear I remember some food in there somewhere. At least I know it stirred a craving for some good Indian food somewhere inside of me. Maybe I was just smitten with the Monsoon. I love rain. I am a water sign. But even if food is not the main theme, I know there will be so many beautifully inspired dishes that come from watching this film. I mean, a wedding, India, Texas...those hints right there are enough to start the wheels turning, are they not!? So please, join us! 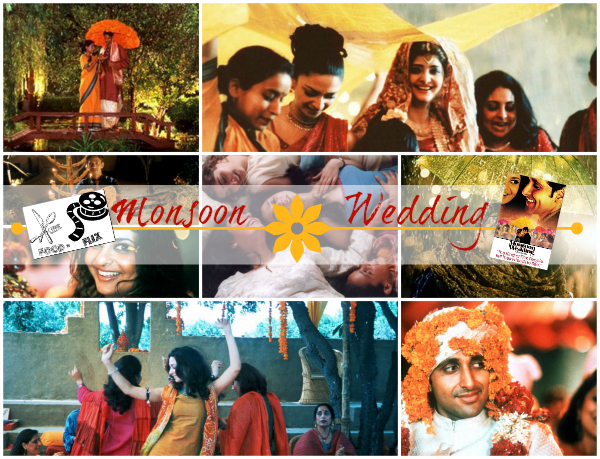 Watch the chosen film (Monsoon Wedding). Taking inspiration from the film, head into the kitchen and cook or bake or make something.